Like most of the wwworld you’re probably trying to understand what bitcoin is. Yes there’ll be more of these articles published here, created a dedicated category just for it. Ready? Before we get to anything bitcoin related here on Web AddiCT(s); I’d like us to stop the hype train for a minute. Breathe and apply some hybrid thinking (10 minutes) to understand how and why we got here. In his TED Talk, The next 5000 Days of the Web, Kevin Kelly sheds light on what the internet is becoming. Those 5000 days only ends somewhere around 11 October 2020. Watch where the web (and all of us) are headed over there and come back to the future here. What has this got to do with it? Everything. The inventor or the world wide web Tim Brenners-Lee calls for Raw Data Now!. When the person who created the web asks for something to be done on the TED stage you bet it’ll happen. Remember, we’re wearing our hybrid thinking caps, come along watch the inventor of the internet’s talk below. How does raw data relate to it? Everything. Has the light bulb gone on after watching these videos yet? First found out about bitcoin while spending time at the MIH Media Lab. Really stoked to have worked with some of these folks on their projects. Had a pic of one of their actual minted metal bitcoin from then but can’t find it anywhere. So how/where do I buy BTC? Created a bitcoin wallet, tried some mining, lost my private keys. *shrug* It’s not ready for prime time yet. Say hello to the decentralized economy — the blockchain is about to change everything. In this lucid explainer of the complex (and confusing) technology, Bettina Warburg describes how the blockchain will eliminate the need for centralized institutions like banks or governments to facilitate trade, evolving age-old models of commerce and finance into something far more interesting: a distributed, transparent, autonomous system for exchanging value. It’s back on my radar. Let the research begin. Richie Etwaru, discusses the opportunity and implications of blockchain as a paradigm to slow/chose the expanding trust gap in commerce. He unpacks blockchain to a level of simplicity to be consumed by those that are just starting to understand and explore the paradigm. He lays out a current state of commerce, suggesting that every company is currently at risk of being disrupted or incurring severe strain from a blockchain version of itself. Bought 0.02 BTC after 6 months of research and being aware of the technology for 7 years. I’m usually an early-adopter, think about that. Started a bitcoin experiment which ends on 31 December 2017. Part of the experiment is accepting payment for the services I provide my clients in BTC. Received first payment in BTC for services rendered a month later. Four of the most challenging months later and more than half of the invoices I’ll issue within the next few months will be settled in BTC. Hello, future, now. Who knew? At the time of publishing this post $6156/BTC. What is 1 bitcoin worth today? If you’ve read this far I’m sure you can spare a few satoshi 1D3gx7tc34GP2QMoVvKMqEFLm93emJxA9Q 😉 or if you have no idea what a satoshi is the next article will help with getting started with Bitcoin in South Africa. Scientia potentia est. 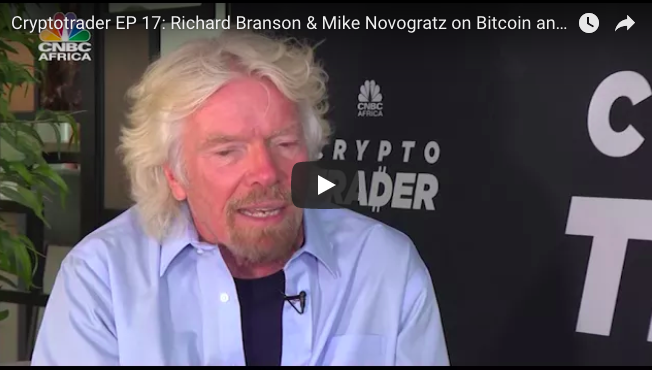 Sir Richard Branson talks Bitcoin on CNBC Africa with Ran Neuner‘s show which happens to be the only television show dedicated to cryptocurrency anywhere in the world. Bitcoin price predictions for the rest of 2018 here. Host Ran Neu-Ner takes his weekly plunge into the world of Cryptocurrency trading where he chats to traders, ICOs and gives you, the audience tips and tricks on trading in Cryptocurrency.